The Minirig portable speaker and subwoofer are not new products but having just returned from a camping holiday where I used them extensively I’m reminded just how spectacularly good they are and I just wanted to share with you why. You can buy the portable speaker or the subwoofer separately or they can be teamed up in a multitude of ways, including having a full 2.1 stereo setup. However, just one portable speaker on its own is plenty to get started. Built here in the UK, the first thing that’s so striking about these speakers is that they’re incredibly well made. The outside is a cylinder of thick aluminium capped by chunky plastic rings and a beautiful drilled aluminium speaker grille. It all adds up to a speaker that can survive just about anything, including the full weight of my 13 stone frame. Keep it inside its supplied padded fabric case and it’ll just about survive a fall from space. It’s a neat little bag too that has enough space for the speaker, its charging cable and a stereo jack cable. You’ll also see on the bag that this is a Bluetooth speaker, and sure enough it can be paired with your phone in the usual sort of way. Alternatively, you can plug an audio cable directly into one of the two inputs. Why two inputs. Well they allow for a modicum of volume control, as the speaker has no volume control of its own but relies on the output of your device. The top one is more sensitive so is ideal for mobile devices that have fairly weak outputs while the lower one is better for laptops or other devices that can deliver a more powerful signal. You can also pair one speaker via Bluetooth then connect another speaker by cable and create a stereo pair, or add in the subwoofer for a 2.1 setup. 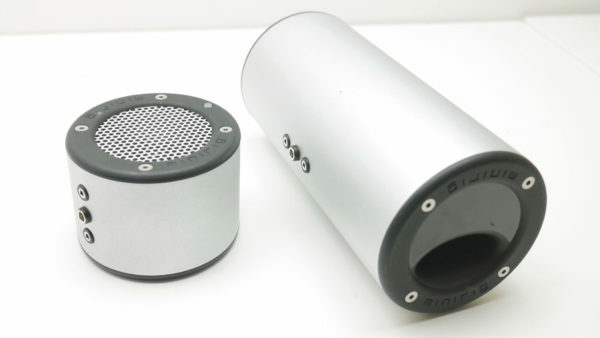 Said subwoofer is essentially identical to the portable speaker but far longer and comes in a clever case that allows you to poke the cables through and just unzip the ends, rather than go through the faff of taking it completely out of its case. Neat as that is it’s hardly a reason to go out and buy one of these speakers. No, the reason for doing that is they sound amazing. Thanks to each portable speaker, and the subwoofer, using just one large speaker rather than a stereo pair they can deliver far more depth and power than anything of comparable size. Well, the icing on the cake is that these speakers also last for ages too. At low volumes both the subwoofer and portable speaker will last up to fifty hours, while at maximum volume these figures drop to six and ten hours. In my experience I’ve found that they seldom need to be pushed much above a quarter volume if you’re in, say, a hotel room, or much above half way if you’re outdoors, so they can easily last 20 to 40 hours. So, you should go out and buy some of these speakers, right? Well, unfortunately there are a couple of catches. One is fairly minor, which is that the charging cable is a proprietary USB to barrel type, so if you lose it on holiday you’ll struggle to find a replacement. You can at least charge your phone from it though, with yet another proprietary cable. Far more of an issue is that they’re expensive. Each portable speaker costs £130 while the sub costs £140. Both are reasonable value in comparison to many premium portable speakers but it’s still a lot of money for something that may get left at a campsite or left out in the rain. Minirig does have bulk discount offers for if you buy a 2.0 or 2.1 setup but for most people I’d actually recommend getting one portable speaker to start and then jumping straight to buying the sub. The portable speaker can go anywhere with you while the sub is great for BBQs in the garden or taking on trips where you’ve got a bit more space. Whicheer combination you choose, though, you’ll be glad you took the plunge.